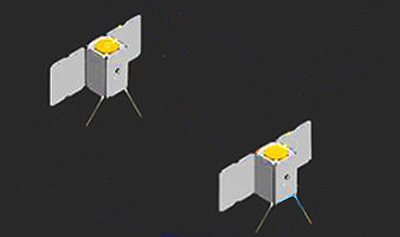 The RANGE (Ranging And Nanosatellite Guidance Experiment) cubesat mission involves two 1.5U cubesats flying in a leader-follower formation with the goal of improving the relative and absolute positioning capabilities of nanosatellites. The satellites’ absolute positions will be tracked using GPS receivers synchronized with miniaturized atomic clocks, and will be validated using ground-based laser ranging measurements. The relative position of the satellites will be measured using an on-board compact laser ranging system, which will also double as a low-rate optical communication system. The satellites will not have an active propulsion system, so the separation distance of the satellites will be controlled through differential drag techniques. The results of the mission should serve to enable more advanced payloads and future mission concepts involving formations and constellations of nanosatellites. The piggy-back launch of the satellites in 2016 is sponsored by Skybox University Cubesat Partnership. The satellites are to be launched on Spaceflight Industry's SSO-A multi-satellite launch on a Falcon-9 v1.2 (Block 5) rocket.